Junior Tom McNutt experiences fraternity life at AU a little differently than most of his brothers. McNutt, a member of Sigma Phi Epsilon, is part of an increasingly noticeable group of AU students who have not historically been known to join the fraternity ranks, at least openly: gay men. McNutt knew many of the Sig Ep brothers before he rushed the fall semester of his sophomore year, and had already come out to them. Doesn’t that strike you as a quintessentially AU story? At our bastion of social engagement and east coast liberalism, it’s totally cool for one of the bros to just dig dudes. Newsweek ranked AU as the sixth-most gay-friendly school in the country this past September, and openly gay fraternity brothers are visible on campus. But we’re not perfect. Liberalism, the historically macho culture of fraternity life and a vocal LGBTQ community have proven a potent mix. McNutt has successfully navigated the two communities, and so have many other students. Not all of them though. 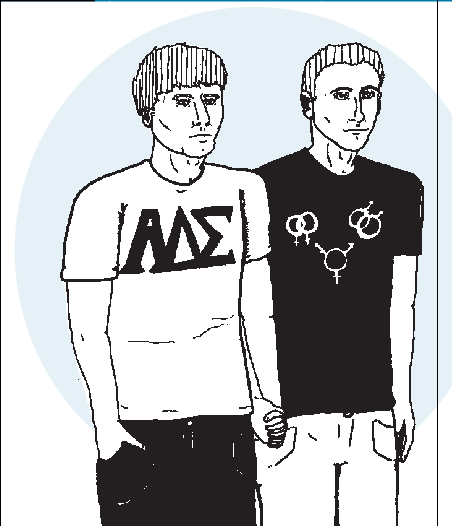 In Fall 2009, a member of AU’s LGBTQ community was waiting on the LA Quad for a ride to a frat party with her friends. Allegations of such scarring discrimination within fraternity life are few and far between — but this isn’t the only one, and a little bit goes a long way. Even a few incidents can lead to whispers, rumors and apprehensions that eventually paint a dark portrait of AU Greek culture.These apprehensions aren’t new. When bisexual graduate student Leah Gates started her undergraduate career in 2005, she heard about brothers saying things like “Sorry, no room for dykes on this trip.” Even though nothing like this has ever happened to her or a friend, these stories had an impact. Gates, now about to finish graduate school, has never been to a fraternity party at AU. Junior Carter Gibson, a brother of Delta Tau Delta, sits on the Interfraternity Council (IFC) as vice president. He identifies as gay and feels that AU fraternities are inclusive toward the LGBTQ community. He can attest: his sexual orientation has never been an issue for his fraternity brothers. But do others cross the line? The individual in question told AWOL that he never used the word “fags.” He also claimed he never kicked out the student, but threatened to do so if he continued making unwanted advances toward another male at the party. The student disputes this account, claiming he made no such advances. The president of the fraternity adamantly denied that any wrongdoing occurred. He and the accused brother threatened to sue AWOL for libel when they were contacted about this article. Even if Toomey is cautious, Carter Gibson still argues that AU Greek life is open and accepting. One AU freshman was walking home with a boy from a fraternity party her second night on campus. About a quarter of the way back to her dorm, he decided to go back to the party. This illustrates what might be a bigger barrier to gay students’ participation in fraternity life: girls. It’s an issue that can manifest itself in every corner of the fraternity system. For example, getting rides to parties. Sophomore Adam Powers has only been to a couple fraternity parties, but he finds the focus on getting girls ubiquitous. Lynch is another gay AU fraternity brother. He used to have a negative perception of fraternities, but decided to give Greek life a chance his sophomore year and rushed. “I was looking for brotherhood — it was always something that I was lacking,” he said. He has been impressed by how accepting and open-minded his brothers have been, but he noted that at times they could be more conscientious with their word choice. Sometimes, brothers are told they “can bring girlfriends” to certain events, for instance. With a social structure built on traditionally masculine ideals and norms, in which women become objects of sexual desire and a barometer of a party’s success, a guy who likes guys doesn’t always fit neatly into the system. That doesn’t mean that the system can’t adapt, but rather that it favors the interests — at least the romantic or sexual interests — of straight men over gay men. Lynch’s experience perhaps best illustrates the intersection of gay and Greek at AU. Pi Kapp has given him the brotherhood he yearned for and overturned his preconceived notions, but when talk turns to girls and girlfriends, not all brothers remember boys and boyfriends. Carter Gibson, a member of Delta Tau Delta.